Are there style files available to use with TeX/LaTeX? What else do I need to create PDF documents using (La)TeX? How do I create compliant PDFs from (La)TeX source? Should I use dvips/ghostscript/distiller combination, PDFLaTeX or dvipdfm? My TeX installation uses bitmapped fonts, what should I do? The zipped file pack ieeeconf.zip. This contains the LaTeX class file ieeeconf.cls, a sample LaTeX source file root.tex and the compiled document root.pdf. Some conferences may require that special templates be used. Please check the website of your conference. These templates cannot be downloaded here. \overrideIEEEmargins                                      % Needed to meet printer requirements. A LaTeX distribution for your platform, e.g. MikTeX 2.3 or higher (for Windows), TeTeX 1.0.7 or higher (for Linux and other *nix flavors) and OzTeX 5.1 or higher (for Mac). Make sure that your installation uses Type 1 fonts. Earlier versions of LaTeX used Type 3 or Bitmapped fonts. These are not scalable (i.e. render well on screen as well as print). The paper submission system checks for fonts used and if it detects Type 3 fonts, the paper cannot be uploaded. We cannot assist with installation of these packages on your system, however, they all come with extensive installation notes. Adobe Distiller	6 or higher (Windows). This comes with Adobe Acrobat Standard or Professional 6 or higher. Options 1 and 2 are high quality open source software and widely in use. Adobe Distiller is a commercial product. There are several other products (free or commercial) in the market that can produce compatible PDF files. However, there is no support available for them through these pages. Some distributions of LaTeX (e.g. MikTeX) come bundled with pdfTeX that can directly create PDF files from TeX source. However, this will require that you have all graphics/images of your document available in PDF format. 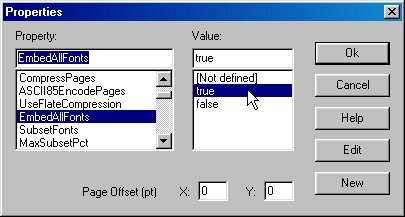 It cannot convert encapsulated postscript to PDF. Its use requires minor modifications to the LaTeX source file and the details for that appear in pdfTeX documentation and are not repeated here. These instructions have been tested under Linux with teTeX 1.0.7 and Ghostscript 7.0.4, and more recently with teTeX 3.0 and Ghostscript 8.15. Without -d[options] listed above, ps2pdf will not embed and subset fonts as required by PDF compliance and your paper will not be ready for upload. Note that if you specify the Adobe Times, Helvetica and Courier font families (the so-called base 14 fonts) to be used but do not have them installed on your computer then they will not be embedded. Pdf files with these fonts missing may or may not be accepted depending on the conference settings; they often are. 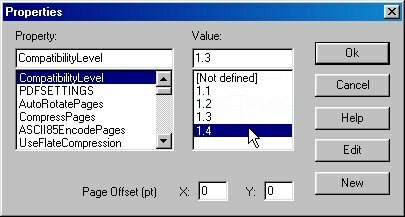 Do not omit the target paper size in each step as your system may have a default paper size setting that differs from the target paper size. and it will work like a charm. This was tested with MiKTeX 2.3 and Ghostscript 7.04 and more recently wth MikTeK 2.8 and Ghostscript 8.6. 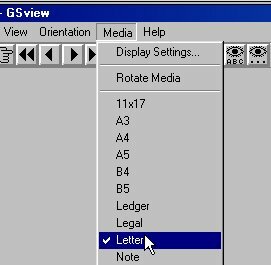 If you are using Windows, we strongly recommend using GSview, a graphical font end to Ghostscript, to convert your postscript file to pdf. 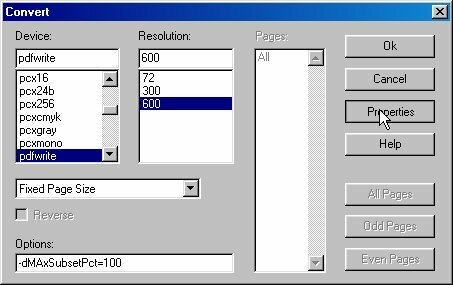 It provides an easy interface for setting up the above parameters for ps2pdf. Follow the steps of the previous item to generate a postscript file from your LaTeX source file. Open the postscript file in GSView. This option makes sure that the files will be viewable by readers with Acrobat Reader 5 and later. These two settings, together with "-dMAxSubsetPct=100" will ensure that all fonts are embedded as required. This generates the postscript file "sample.ps". Next, launch Adobe distiller. Here are the screen captures of settings in Distiller 5.0, similar settings also exist on other Distiller releases. Next, click on the "Fonts" tab and enable font embedding as shown in the third figure. You may want to save this setting as (say) a joboption CSSconferences and you can reuse it for future conferences. Alternatively, you may load the IEEE joboptions and it will set up suitable options. Important: If you are setting up joboptions on your own, make sure that the PDF compatibility is set to "Acrobat 5.0 (PDF 1.4)". IEEE will not accept papers with PDF 1.2 or 1.3 compatibility. PDFLaTeX is a special version of LaTeX by Han The Thanh which produces PDF output directly using Type-1 fonts instead of the standard dvi file. However, it is still in beta version and does not accept all of the LaTeX packages or postscript figures. For this path you must convert all of your postscript figures to pdf. This can be done by "epstopdf" or Adobe's Acrobat distiller. In addition, you have to change your TeX-file, at minimum to include the .pdf-graphics. If you start a new document from scratch, intended to get a PDF, this path is the first choice, although pdfLaTeX is still in "beta-state"
LaTeX and pdfLaTeX behave by default differently concerning the character-spacing. As a result, the same TeX-File compiled with LaTeX and pdfLaTeX may show different line-breaks, paragraphs, page-breaks etc. Fortunately, there is a switch in pdfLaTeX to ensure LaTeX spacing. pdfLaTeX uses per default Type-1 fonts. 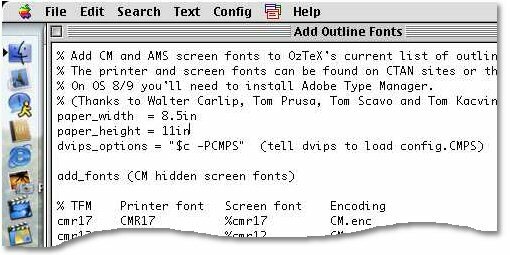 If you are using a Mac system with OS 8.6 or lower, you will need to use OzTeX 4.1 - then you have to make sure that you have Type 1 fonts installed since the installation comes with Type 3 fonts. Else, download and install the latest version OzTeX that comes standard with Type 1 CM and AMS fonts. Download the Mac version of ieeeconf.cls with appropriate carriage returns. Some users have experienced difficulty converting the windows version to Mac leading to compilation problems. 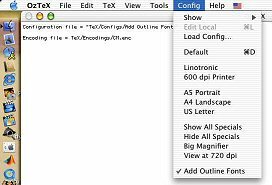 In Oztex 5.1, use the "Add Outline Fonts" config. Finally, when you dvips, the options -CMPS should automatically pop-up. Leave it alone. OzTeX hints and images courtesy of Brad Burchett. Should I use dvips/ghostscript/distiller combination, PDFLaTeX or dvipdfm? There are currently two viable alternatives in producing compliant PDF documents from LaTeX (the dvips method and the pdfTeX Method). The first option is currently the best one owing to the fact that the LaTeX source file does not have to be modified, all style and class files are supported, and bitmapped as well as postscript figures can be included directly into the final PDF. Both methods of creating compliant PDFs work well. However the work flow and requirements are slightly different. Of course, they all require that the TeX installation being used supports Type 1 fonts. Dvipdfm generally works well, but has some bugs in processing certain types of .eps figures. 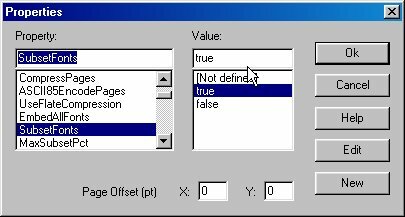 The only reliable way to work with dvipdfm when including encapsulated postscript figures in your document is to first convert them to PDF. My TeX installation uses bitmapped fonts, what should I do? All earlier TeX/LaTeX installations used METAFONT technology to create Type 3 fonts. These fonts were customized for the printing device for which they were meant. Unfortunately that does not help in the creation of PDF that renders well on the screen as well as in print. If you have the (La)TeX system installed on your own computer, upgrade it to a newer version. Most newer packaged distributions come with Type 1 fonts. All packages mentioned above support Type 1 fonts. If you are using a network installation of LaTeX, please request your system administrator to upgrade the installation with a more recent distribution. Unfortunately, there is no reliable way to convert fonts from bitmapped to vector once the document has been generated. The changes have to be made when converting from latex --> dvi --> PDF. I am using vector fonts, yet the PDF test says there are bitmap fonts in my paper. What should I do? It may happen that even if your installation uses Type 1 fonts only your pdf document still contains bitmapped (Type 3) fonts. The most likely source for bitmapped fonts are images that might be using bitmapped fonts. You may check if these fonts originate from the graphics in the document by compiling the source file without the graphics. The solution will be either to regenerate the offending images using Type 1 fonts or to convert them to raster images such as JPEG or PNG..